A Jeep Wave to remember those who died while serving to protect the USA. We hope this day is less about the bbq’s, the beach, and the day off of work and more about remembering and reflecting about how and why we are able to enjoy what we have in this country. In large part, due to those who made the ultimate sacrifice. We posted last week about a new initiative going on at jeepwaves.com. We are donating 10% of all purchases made to the Wounded Warriors Fund. We believe this is a great cause and something all of us can get behind. While a day like Memorial Day is well needed, supporting wounded vets is something we can do everyday, not just the last day in May. Don’t make this a reason to buy a decal or a shirt today, because that’s not what today is about. But, hopefully this philanthropy is something we can take pride in when making future purchases. One last thing. A tribute from last year from a super hero to the real super heroes. With the recent success of Jeep Wave Day, we wanted to help spread the word about another great project, the Wounded Warrior Fund. 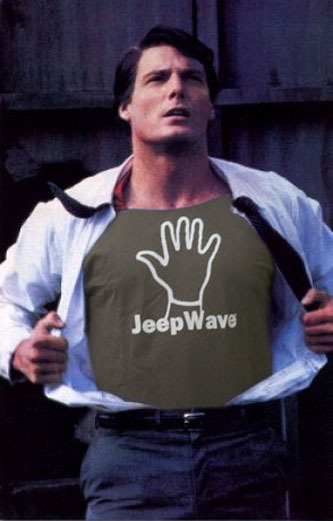 As of May 2012, all purchases made through our eBay auction pages, will include a donation made by jeepwaves.com to the Wounded Warrior Fund (10% of the total purchase amount). We think this is a great project and something that everyone can get behind, regardless of your politics or other beliefs. Hopefully, you all agree, because we’re doing it anyway. So, head on over to our eBay pages and get yourself a decal or shirt to support the Jeep Wave and support our troops in the process. Thanks!